OMB Director Donna Arduin and budget director Lacey Sanders present supplemental budgets to the Senate Finance Committee on Jan. 29, 2019. Gov. Michael J. Dunleavy continued to dominate the news out of Juneau on Tuesday as districts, legislators and the public digested his supplemental budget and its proposed $20 million cut to one-time school funding. The House is still without organization and the Senate continues to churn through confirmation hearings. It’s true that the $20 million represents a relatively small fraction of the total funding the state puts into education, but that doesn’t mean it’s inconsequential to cut it out of the current school year either. Many districts have used it to hire teachers back after years of flat funding from the state have forced districts to cut teachers and programs while also hiking local property taxes. Below, we’ve pulled the financial information on every school district in the state showing the traditional formula funding, the impact of the $20 million one-time funding and the district’s estimated average daily membership numbers. There’s been plenty written now about Gov. 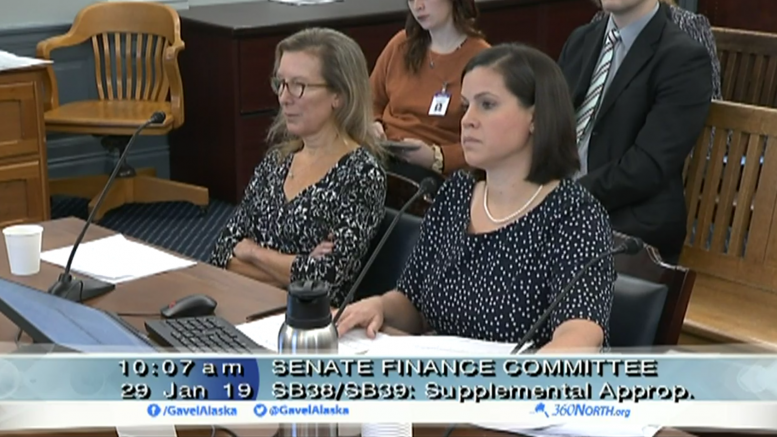 Michael J. Dunleavy’s proposed $20 million cut to schools, but it overshadows what was a particularly bad showing by Office of Management and Budget Director Donna Arduin and budget director Lacey Sanders in front of the Senate Finance Committee on Tuesday. The pair were up to present the governor’s two supplemental budgets to the committee, but often didn’t seem prepared to answer even basic questions about the timing of the requests, the need for the requests or the impact of the requests. The committee was frequently told by Arduin and Sanders that they’d have to get back to them with answers (which perhaps works for the committee, but rarely makes its way back to the public). It also seemed that the administration was intent on changing the legislative intent for various funding changes, like the decision to cut about $3 million that had been set aside for the Village Public Safety Officer Program. Arduin and Sanders justified the cut because not all of it had been utilized, a claim that was bitterly contended by Sen. Donny Olsen, the Golovin Democrat who lead much of the day’s charge on the budget. Olsen pointed out that the money had broader authorization and was intended for any additional recruitment and retention efforts. The outrage with the budget moves wasn’t reserved for minority Democrats. Sen. Lyman Hoffman, the Bethel Democrat who caucuses with the Republicans, said the move—which offsets an increase to troopers for recruitment and retention efforts—creates two different classes of Alaskans. Sen. Click Bishop, the labor-friendly Fairbanks Republican, jumped in to add if they really want to know how to fix recruitment and retention within the troopers that they should perhaps consider an actual pension-style defined benefit retirement system instead of the 401K-style defined contribution plan currently offered. Perhaps one of the roughest spots came when Sen. Bert Stedman, the crafty Sitka Republican who co-chairs the committee, asked about some changes to the Elected Public Officials Retirement System and why it needed an additional $65,000. The answer, which Stedman seemed to know (and which you could find by looking at OMB’s budget documents), was almost entirely fumbled. Surprise, the House still doesn’t have an organization. Attorney General designee Kevin Clarkson had his confirmation hearing in front of a joint hearing of the Senate State Affairs and Senate Judiciary committees. It went pretty much as expected with Democratic senators raising pointed questions about Clarkson’s past as the legal champion of conservative causes like defending anti-abortion laws, defending religious groups from discrimination claims and plenty others. Republicans did their best to wave away concerns any of those views would carry over and focused on his professionalism. There’s plenty to dissect from the hearing, but the answer to a question from Juneau Democratic Sen. Jesse Kiehl about Clarkson’s involvement with the Defending Freedom Alliance, a conservative religious liberty group that’s been labelled a hate group by the Southern Poverty Law Center (perhaps wrongly in Sen. Shelley Hughes’ opinion). Kiehl asked specifically about the group’s involvement in pushing for forced sterilization laws for transgender people abroad. “I can tell you that I’m aware of absolutely nothing involving their support of criminal penalties for any sort of lifestyle choice that an individual might make,” he said. My partner in podcast crime, Pat Race, offered this updated look at state spending. That per-barrel credit sure is looking interesting when Gov. Michael J. Dunleavy cheered on a company at his State of the State address for doing business without any subsidies or tax credits from the state. The Legislature sure seemed impressed, too. 2 Comments on "AKLEG Day 15: Here’s how every school district would be affected by Dunleavy’s $20 million cut"
The more money they get, the less effective they are. This works for me. First, the money available to the Legislature of the roughly $16 Billion in the Permanent Fund (PF) Earnings Reserve (ER), is roughly about $11 Billion. The other roughly $5 Billion includes Walker Administration held-back and challenged PFD monies still to be distributed. How does the money expressly transferred from the Earnings of the Permanent Fund Corporation for the defined purpose of funding the PFD. The AK Admin. Code for the Attorney General lays the burden of ensuring payments made to individuals are actually going to those individuals. Of course, no one under Walker’s administration decided to accept those words at face value. Defined benefits are far more expensive to employers than 401k plans. The private sector has been successfully relying on 401k plans for over 35 years. Government needs to become more conscious and conscientious regarding spending the people’s money. We should not abandon the very well thought out, and so far succesful, transition to the 401k plans. The VPSO budget item has been over-funded for several years (at least that is my understanding). There just weren’t many folks in the villages who wanted the job, which carried little authority. Which budget document defined the $3 Million line item as ‘recruiting and training’ funds?